Although I was born in Beijing, my ancestral hometown is in Qingdao, Shandong province. There were plenty of different street food near the neighborhood where my grandma’s house in Qingdao was when I was a little girl. Thus, back in the deep of my memory, I was simply fascinated with the snacks that I enjoyed on the street. One of them is Má Huā (Chinese: 麻花). It is well-known that TianJin is the city which is the most famous for Má Huā, however, Má Huā is not typical to TianJin. We also have Jisan Má Huā in Shanxi province, Xianyang Má Huā in Shaanxi province and so on. Overall, it is a Han ethnic food with various flavors in different places, which is made of two or three twisted strips of dough and usually fried in peanut oil. Since it looks like hinge, it is also called “hinge stick” in Chinese (Chinese: 绞链棒). It describes the clothes is almost torn up due to wear and tear. Má Huā can be either sweet or salty. Má Huā contains a lot of protein, vitamin and trace elements that is good for human body under its shiny golden color. Although it is fried, it is not fatty at all, so it is ideal as a kind of snacks. When it is the “Beginning of Summer” (Chinese: 立夏), there is a tradition of eating Má Huā in the Northeast area of China. 1. Put wheat flour and peanut oil with salt and water together into a container, well mix them and wait for 20 minutes to let the dough ferment. 2. Take out the well-fermented dough and cut it into many tiny pieces of dough, and then rub each tiny dough to make it into strip shape (Depend on your personal preference, you can also add sesame and sugar into the dough when you rub it). 3. Continue to rub each strip shape dough in opposite direction and close the ends to make a raw Má Huā. 4. Put the oil into the pan and fry the Má Huā when the oil is not too hot yet. I got to know Má Huā so well because it is a tradition to my family to make Má Huā by ourselves during the Spring Festival. What is interesting is that our cooking method is different than others. We not only add sesame and sugar into the dough but also use olive oil to fry. What’s more, the way of making raw Má Huā is different than simply rub it till it becomes strip shape but we make the dough as a thin pancake and then cut it into small pieces. At last, we roll over one side of the edge and make it as a Má Huā shape. There are different histories of different type of Má Huā from different places. No one can tell for sure when and what the exact origin of Má Huā is. However, there is one among them that I find most interesting to me, which is the origin of Daying Má Huā in Henan province. It is said that at the end of Ming Dynasty, there were a lot of poisonous scorpions in Daying and many people died because of being bite by the scorpion. So the local people decided to make twisted dough which looked like the tail of scorpion and eat it after frying in order to curse the scorpion every the second day of February of Chinese lunar year. It is called “eat the tail of scorpion” (Chinese: 咬蝎尾). Later the tradition gradually developed into making today’s Má Huā. And Má Huā thus implies fortune and happiness. Whenever there is someone either get married or pass away, the local people will give Má Huā as a gift to express their best wishes to the ones. TianJin GuiHuaXiang ShiBaJie (Chinese: 桂发祥十八街) Má Huā is the earliest Guinness record keeper of Má Huā in China. They created the largest Má Huā in the world at that time. It was 1.5564 meters long and 24.98 kilograms weight. China Daily reported about a man named Wang Dawei, a youtiao street food vendor from Weifang in East China‘s Shandong province, who offered a 100,000RMB reward to any individual who could disprove his claim that his youtiao was not aluminum-free. 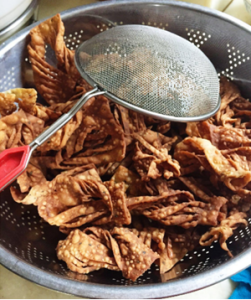 Many people know that the secret ingredient local street food vendors use to make their youtiao extra-puffy and crispy is aluminum sulfate crystals, a highly toxic ingredient if consumed too often or at large amounts. 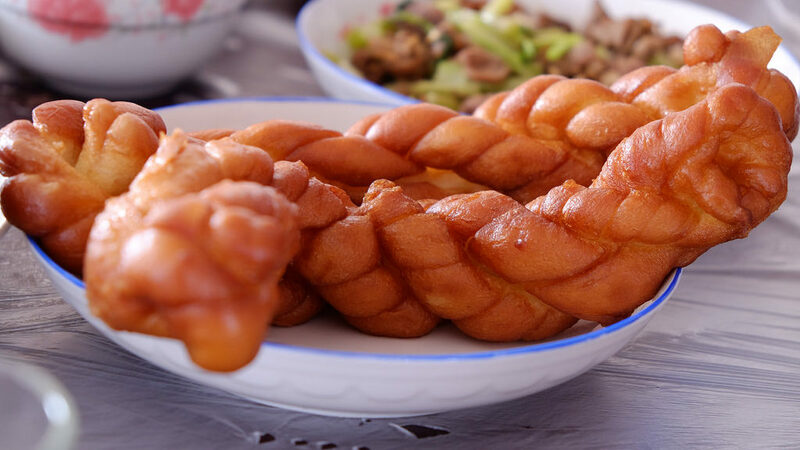 Yóu Tiáo (Chinese: 油条), also known as Chinese cruller, oil stick, doughnut, and breadstick, is a trip of fried dough that is typically eaten for breakfast. It usually is served as an accompaniment with rice congee, soy milk, or tofu soup where they are either served whole to be dipped into the liquid or cut into smaller pieces to be sprinkled on top. They are lightly salted and fried in pairs with the center attached so that the dough becomes puffy and crispy on the outside and soft and chewy on the inside. You tiao is best eaten immediately after it is fried because of its tendency to become tough or elastic-y if left out for too long. At breakfast, you tiao, can be stuffed inside various carbohydrates such as roasted flatbread (shaobing), rice noodle (zhaliang), or glutinous rice (cifan). Its sweet version is named tang gao, which is similar in appearance to youtiao but shorter in length. You tiao contains flour, water, sugar, salt, baking soda and vegetable oil. Street vendors usually add alum, potassium aluminum sulfate crystals, to recipes in order to increase the puffy, crispy exterior of their bread. All ingredients are combined to form a soft dough, which is kneaded and left to rest two to three times. The dough is brushed with oil and folded then cut into smaller pieces to be stretched out and twisted together into pairs. A wok of oil is heated before the strips of dough are deep-fried till golden. You tiao is nicknamed you zha gui, or deep fried ghost, which stems from a story told long ago during about a public protest that took place during a rather heavy and serious part of Chinese history. The protest involved a famous and well-respected General, Yue Fei, who was appraised by the people for his loyalty towards the Song Dynasty and his Emperor during his time at war defending the kingdom from outer invasions, particularly the Jin Dynasty. At that time, the Prime Minister, Qin Kuai, and his wife, Wang, grew jealous of him and formed a secret liaison with the invading northern tribe of the Jin Dynasty to frame Yue Fei under accusations of a crime and get him executed. Public civilians were frustrated by their inability to defend their General; so in reaction, a shao bing vendor and ci fan tuan vendor decided that they should devise a way to express their opinions. The pancake vendor decidedly sculpted two miniature people out of dough, representing Qin Kuai and Madam Wang. He then began slashing at their figures with his dough cutter. The other vendor brought his deep-fry wok, twisted the two figures together into one piece of dough with their backs to each other, and threw them into the wok full of searing oil. While they were frying, the vendors called out for people to see. As a crowd of passer-byers formed to see the two ugly figures sizzling in the hot oil, they immediately called out, “Fried Kuai!” At the same time, Qin Kuai happened to pass this spectacle on his way from the imperial palace and was enraged with disbelief by the mutiny of his edible figure. During the Cultural Revolution in China, educated youths used food-related propaganda as a way of symbolically addressing issues aimed at the laobaixing. 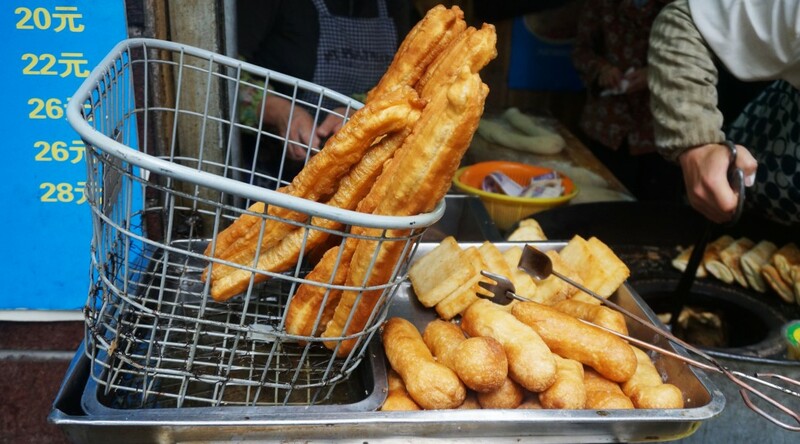 A well-known street food youtiao, a deep-fried cruller that literally translates to “oily strip,” appeared as a political emblem as the cheapest and lowliest form of Shanghai street food. It came to represent the poor economic realities of students receiving government scholarships who could only afford to eat, at most, three youtiao a day. These student activists wanted to motivate the government to fund schools and provide living stipends for intellectuals.